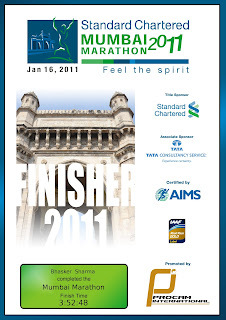 All the stars lined up perfectly this Sunday 16th Jan 2011 in Mumbai for my 26th FM finish(excluding the 4 ultras). 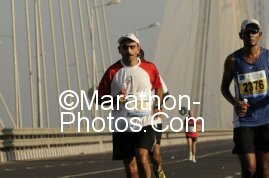 The weather was as perfect as it can be in Mumbai, there was water support on the sea link, I had a good start to the race and excellemt pacing with Priyankar and Ravi for over 32Kms(and Vasu till half-way on the sea link), my shoe laces did not come off, there were no cramps and the body felt pretty good throught out the run. All of this resulted in not only my fastest marathon finish at Mumbai but my fastest ever marathon time of 3:52:48. This is over 3 minutes faster than my previous PB of 3:57:56 in Washington DC in March 2009. And over 8 minutes better than my last year's time at SCMM. Thereby continuing my progression of improving my timing at Mumbai. I did a pretty much even split covering the first half in about 1:54 and second half in 1:59. My average per Km pace was between 5:22 and 5:29 through out the race. I felt extremely good and not too tired after the finish(unlike last year when I was very drained and nauseous at the finish) which led me to think that maybe I could have pushed harder and tried to go sub 3:50. 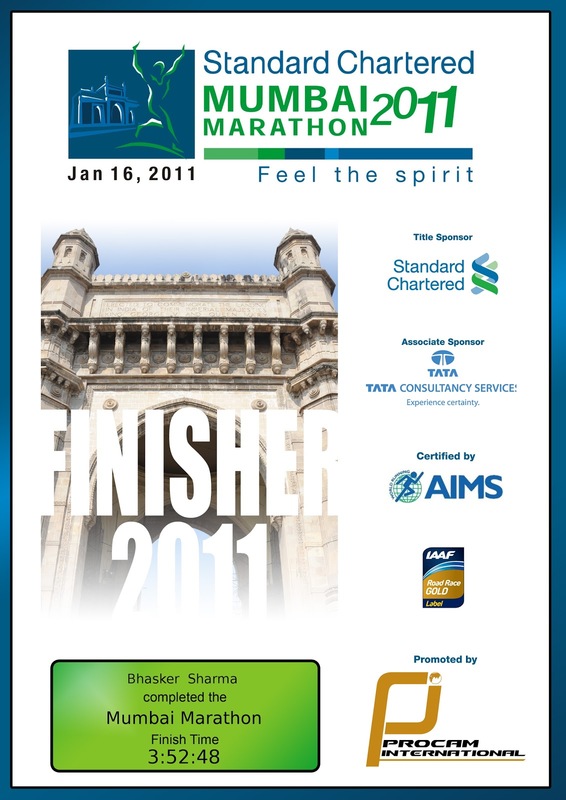 Well that will certainly be the target for SCMM 2012! The narrow entry/exit back into Azad maidan after the race which had hundreds of ill-tempered runners jostling to get in was very frustrating specially for the FM finishers. As in the past there could have been separate entry point for FM runners or the entry/exit should have been broader. Overall though it was a well organised event and many many friends had a great run and achieved their PBs. Congratulations to all the participants!! It is incredible how runners are improving with experience - shows that running as a sport maturing in India and many runners are yet to fully tap their potential. Despite finishing 8 minutes faster than last year my ranking in the veteran category is 13 this year compared to 10 last year! Though oddly enough overall ranking has improved from 90 to 49 - looks a bit fishy! !